What is your favorite Disney Roller Coaster? This shot is not deliberately upside down by some trick — this shot was taken while we were upside down! 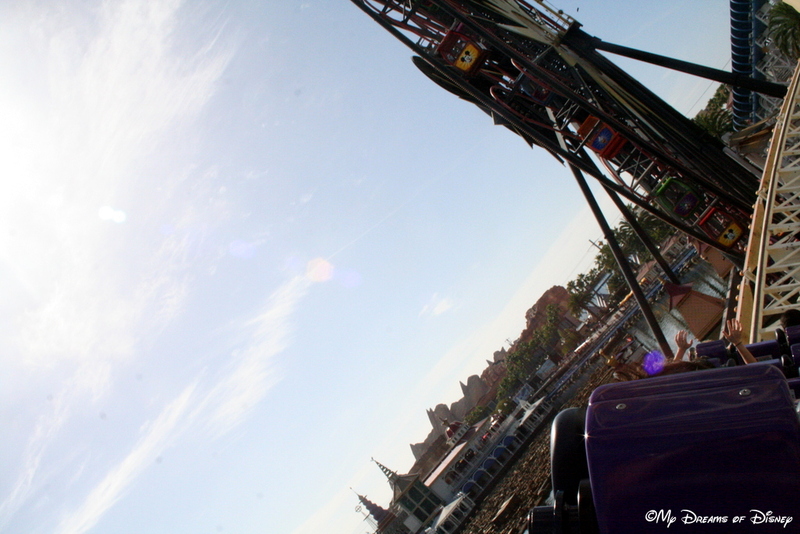 Piggy-backing on yesterday’s post on California Screamin’, we’ve got a poll for you today. Thinking about all of the Disney roller coasters you have experienced in your life, whether it be at the Magic Kingdom, Disneyland, Disney’s California Adventure Park, Disneyland Paris, and so on, what is your absolute favorite roller coaster? There are several to choose from, of course. You’ve got Space Mountain, Big Thunder Mountain Railroad, Expedition Everest, California Screamin’, Rock ‘n’ Roller Coaster, and the list goes on. Have a look at our poll, we’ve included several options to choose from, as well as an option to choose your own. This is an open poll, so it won’t close, and you should be able to choose your own answer if ours doesn’t fit in what you are looking for, so have at it! 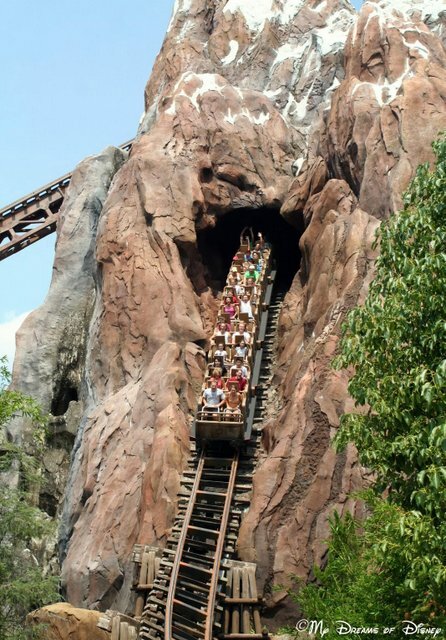 Of course, the Disney parks aren’t like the Six Flags and the Carowinds of the world, so chances are there may be roller coasters at other amusement parks you like better — but for us, we want to know which is your favorite Disney roller coaster, so let us know your thoughts, and thanks! 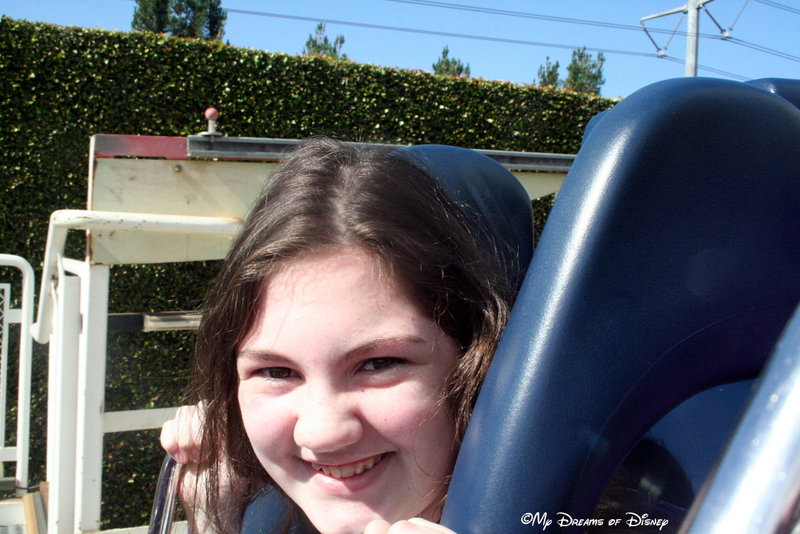 On September 8, 2010, I started this Disney blog. It’s initial purpose was to document the memories I had of trips I had taken to Walt Disney World, so that I could use this fun medium to keep a historical record of my visits. My introductory post is linked here, for those that wish to read the drivel I was writing back then! Five years is a lot of posts — this is post number 1,655 since that first day — so I hope you enjoy a look at some of my favorites! As the years have progressed, my journey into the world of Disney Fan Sites has led me on some incredible journeys, and I’ve met some incredible people, some of whom are my friends to this day. On this special 5th Anniversary post, I am taking a little time to introduce to you some of my favorite posts, but these are also some of your favorite posts as well, at least, based on some of the feedback I’ve received over the years. Sit back, relax, and enjoy our look down memory lane, as we explore My Dreams of Disney through the years. 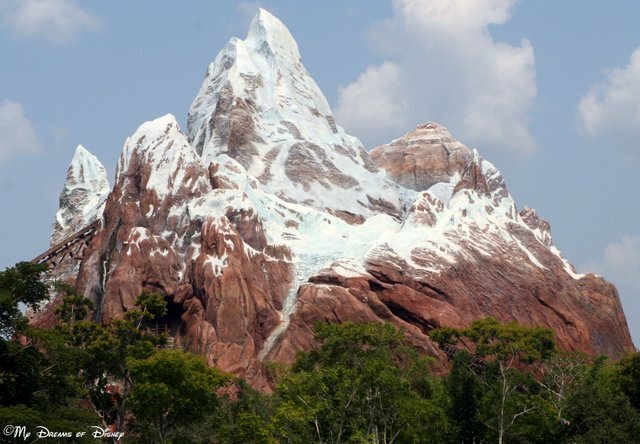 On April 29, 2013, my friend Tanya, who responded to a post I wrote to see if anyone had an interest in writing for My Dreams of Disney, wrote an incredible post about the time that her family was selected to be the First Family at Disney’s Animal Kingdom Park. It was — and still is — a very popular post, because being the First Family at one of the parks means that you are selected to open the gates for the day, and it’s a fun adventure that your whole family can enjoy. It takes some luck, and it takes some thought out processes to make this happen, so check out Tanya’s post to learn her tips on what it took for them. On March 30, 2013, I was asked what my favorite Disney Apps were for my phone. In thinking it through, I came up with a list that, while certainly is in need of an update, is still pretty good in my opinion. Have a look at it, and see if any of those apps are on your phone. One of my first projects on the site, after I documented my early trips, was to start a series of posts about the different lands in the Magic Kingdom. Of course, when I started this, there were 7 lands in the Magic Kingdom — but now, there are only six because of the Fantasyland expansion. However, I still have pages about the missing land, so go check out the page and let me know which one was closed! For me, one of the best things about the hit Disney movie Frozen was the music. It struck such a chord in me that I wrote several posts about it and the impact that it had in my life. All of that culminated in this post, which drew a lot of interest. In case you missed it, go check it out and let me know what you think of it! 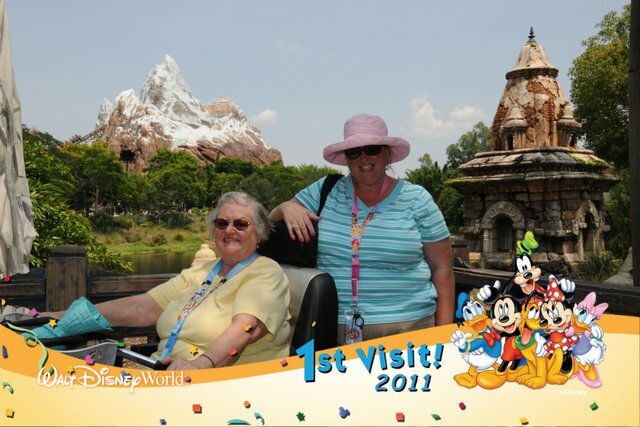 In July 2013, my family made our first trip to Disneyland — and had an incredible time! Out of that trip became an endless debate — which is better, Walt Disney World or Disneyland? To try and answer that question, I wrote two posts — one on why Disneyland is better than Walt Disney World, and another on why Walt Disney World is better than Disneyland. These are certainly polarizing posts, with each of us having our favorites, so check them out and tell us which is your favorite! Throughout the years, a lot of things have come and gone — and in some ways, the Disney focus on our blog has waned a bit at times. However, throughout all of that, one thing still stands — we love the incredible legacy that Walt Disney built, and my family to this day, loves going to Walt Disney World. I don’t know exactly when our next trip to a Disney park will be, but until that time, we’ll spend some time here on the site sharing with you our favorite aspects of the world of Disney. Until next time, I wish to thank each and every one of you, my dear readers, for visiting with us, and for choosing us to help you get your Disney Fix. 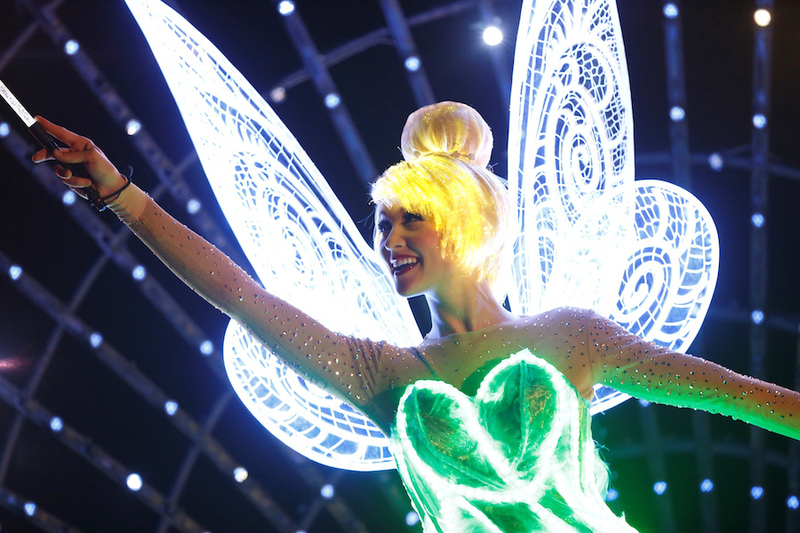 #Disneyland60 – Paint the Night Electric Parade! Today, we continue our look at the #Disneyland60 Diamond Anniversary, as we take a look at the next thing on our list that we are looking forward to seeing. That my friends, is the Paint the Night Electric Parade. Paint the Night Electric Parade! The Paint the Night Electric Parade is new for Disneyland, but I understand that it came over from Hong Kong Disneyland. However, it’s not just a remake parade getting new billing at Disneyland during the Diamond Anniversary. No, this parade has been enhanced with some floats and scenes that you don’t see in Hong Kong, and it’s those additions and changes that make it truly one of a kind. What I think I will enjoy most of all about this is the lighting — being able to see that lighting, with the LED lights, similar to the Main Street Electrical Parade, will really be great to me. I’ve heard that it can be hard to see this parade, that the crowds for viewing are absolutely crazy, so we’ll have to see what we’ll do to ensure that we can see it. On Friday, July 17, the parade will be shown twice — once at 8:50PM and again at 11:59PM. I totally plan on watching the parade once during those two nights, or if not, then on Saturday, July 18, when it is presented at 8:50PM again, and also at 10:45PM. We’ll see how it works out, but I totally am looking forward to seeing the parade! What about you? What I like most at Disney’s California Adventure Park? 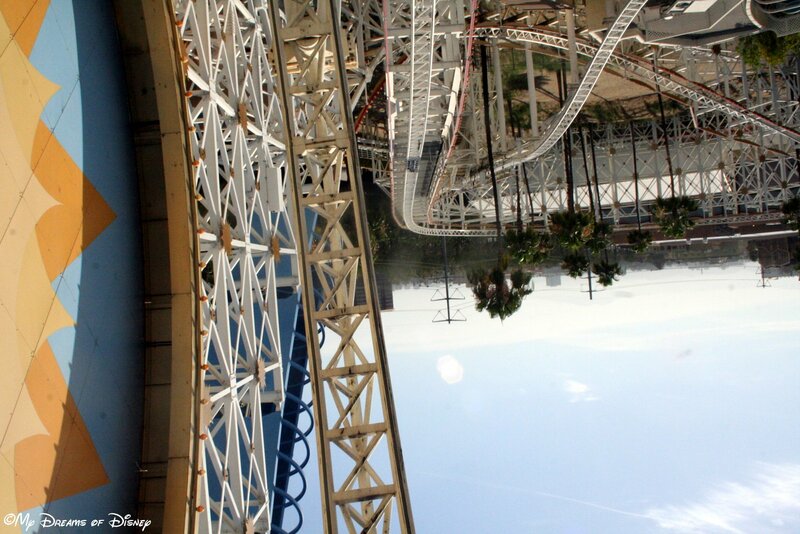 No doubt, it’s California Screamin’! Disney’s California Adventure Park — or DCA for short — has a lot of great things that you absolutely must enjoy at least once in your lifetime if you can get out there. When my family went this past June, we had a wonderful time, and will go back again in the future. This week celebrates the 13th anniversary of the day that DCA opened — February 8, 2001 — so at the Magical Blogorail and the Riding the Rails series, we are asking the question, what do you like most about DCA? 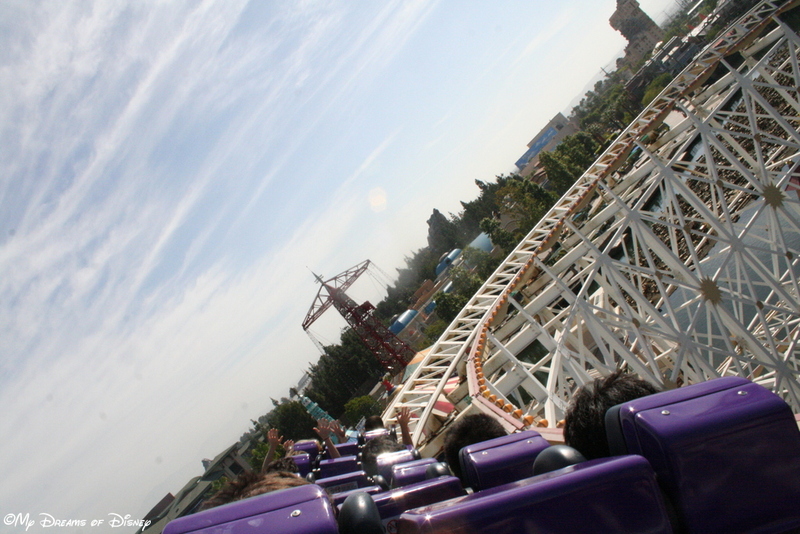 For me, without a shadow of a doubt, California Screamin’ is absolutely what I liked most about DCA! The Rock ‘n’ Roller Coaster starring Aerosmith tries to be the Walt Disney World equivalent to California Screamin’, but in all honesty, it is a distant second when you compare it to California Screamin’. Cindy and I absolutely loved riding this coaster, and Sophie liked it, but not when it went upside down. I think that was just drama happening there, though. Take a look at some of my photos from this coaster, and tell me what you think in the comments! Thanks for stopping by! 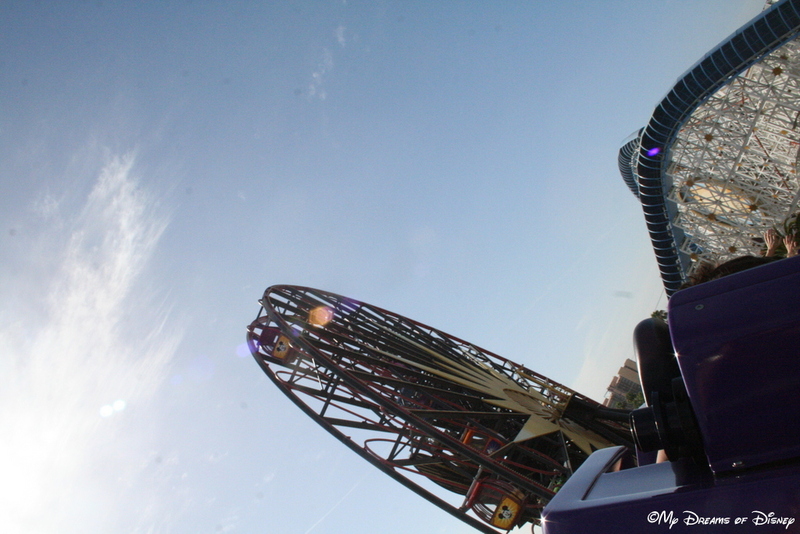 Upside down on the loop! The buildings are not angled like that — we are! Sophie smiles for the camera after the ride is over! Now, click on the button below, and check out the rest of the great entries please! Thanks for stopping by, and go out and make it a Disney Day everyone!